This article submitted by Erin Aagesen on 12/1/99. 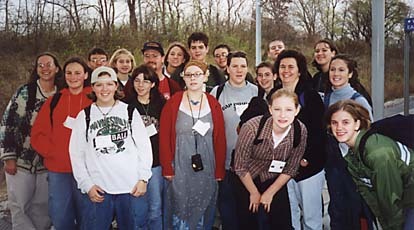 Sixteen students from St. Louis Catholic Church recently traveled by bus to St. Louis, Mo. for the four-day long National Catholic Youth Conference (NCYC). They were joined by 22,600 other youth and 3,700 adults from across the nation for the conference, which lasted from Nov. 18-21. The conference consisted of workshops, speakers, concerts, games, and time to meet and talk to other Catholic youth, and ended with a Sunday mass. The local group included: (front L to R) Amy Buermann, Cassy Frieler, and Amy Mueller; (middle) Jessica Heinen, Kayla Flanders, Sarah Ryan, Angela Meyer, Sara Lieser, Donna Heinen, and Melissa Bachman; (back) Laurie Rausch, Jesse Neu, Erin Aagesen, Don Neu, Tiff Rausch, Mark Braun, Jaime Wendlandt, Jason Leyendecker, and Tricia Hemmesch. Aside from those main activities, which took place in the TWA Dome, participants also had a chance to do some sightseeing. Our youth visited the St. Louis Zoo, the St. Louis Arch, Hard Rock Cafe, and Union Station. They also rode on a Metro Transit bus to and from the TWA Dome. "The best part of the trip was definitely the Sunday mass," said senior Sarah Ryan. "It was cool seeing everyone from our church, even those that didn't know each other well, coming together. It gave me a different perspective on the Catholic faith." Sophomore Mark Braun said, "The most memorable part of the trip for me was the Millennium Eve Party on Saturday night. I went to the dance in the main hall. There were so many people there! It was just fun!" Cassy Frieler, a junior, also had the best time on Saturday night. "Some of us went to a live concert by a Christian rock group. It was really exciting to be dancing with such a large group of people. Afterwards, we got the group's autograph, got fake tattoos, and went through an inflatable obstacle course a few times." Senior Tricia Hemmesch, who also participated in NCYC two years ago in Kansas City, really enjoyed one particular workshop on cultural awareness. "The speaker used humor to get his point across, and it worked. He kept all of us laughing, and still made us think about what he was saying." Laurie Rausch, youth minister for St. Louis Parish, organized the event for the Paynesville students. "The conference was a spiritual energizer for me," she said, "I saw people grow in their faith with other Catholics their age. It reaffirmed why I was called to do this job." Rausch's goals for the trip were to raise enough money through fund raising so that it was affordable for everyone to go, to have things run smoothly on the actual trip, and to have people grow in their faith through the experience. She believes all of her goals were met. Funds for the trip were met almost entirely through fund raisers. Conference participants began working on these nearly a year in advance, with earnings totalling $6,500. Students held a garage sale, a grilled cheese and tomato soup supper, a pancake breakfast, and a Valentine's Day raffle. They also sold magazine merchandise, washed windows, and sold rolls after Sunday masses. Once in St. Louis, Rausch said, "I didn't think there were any problems. It was 99.9 percent awesome." Rausch was joined in chaperoning by Donna Heinen and Don Neu. Student participants include: Jesse Neu, Jason Leyendecker, Kayla Flanders, Jessica Heinen, Jaime Wendlandt, Mark Braun, Cassy Frieler, Tricia Hemmesch, Tiff Rausch, Amy Mueller, Sara Lieser, Melissa Bachman, Amy Buermann, Sarah Ryan, Angela Meyer, and Erin Aagesen. "I didn't think there were any problems on the trip except for the large crowds," said Braun. "It was challenging trying to get on the Metro at the same time as 10,000 other people. It felt great, though, to be singing and dancing all at the same time as 20,000 other people in the Dome. It was definitely worth it." "It's hard to explain what went on in St. Louis," said senior Jessica Heinen. "All these people came together and it was really overwhelming." "It was so much fun meeting new people," said Frieler. 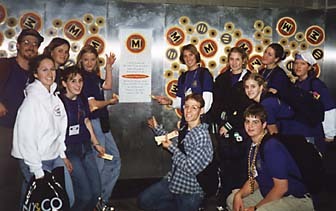 "If you saw someone, even outside of the Dome, with an NCYC name tag on, you knew you could talk to them. Everyone was so friendly. I met people from all over the country." Meeting other participants was made easier through trading. Each parish brought things to trade with other conference participants such as buttons, necklaces, and pencils. St. Louis parish brought miniature slinkies. "Everyone loved our slinkies," said Hemmesch. "We had a lot of people come up to us because they wanted to trade with us, and we ended up making a lot of friends that way." Rausch hopes that the excitement of St. Louis doesn't get left there. "Everyone needs to tell other people what happened in St. Louis. It has a lot more meaning when students tell other students than when I try to tell them." Four Paynesville students are currently fund raising to attend World Youth Day this summer in Rome. Another NCYC is planned in two years in Indianapolis. "I would definitely recommend other people to go on these trips," said Frieler, who is one of the students traveling to Rome. "I'm already telling people to go."